Thomason will be on hand at An­gel City Brewery, 216 S. Alameda St. in the Downtown Arts District, on Saturday, Sept. 20, from 4 to 6 p.m. to promote her book, published by Pasadena-based Prospect Park. The company is also known for publish­ing Naomi Hirahara’s most recent Mas Arai books. Thomason’s original cel vinyl paintings were inspired by 19-cen­tury ukiyo-e artist Hiroshige’s “One Hundred Famous Views of Edo,” and incorporate the vertical oban format and technique of bokashi or color gradations. For four years, Thomason roamed her beloved Los Angeles, seeking the vistas, nooks, bridges, signs, streets, and landmarks that most captivated her. Inspired by the color, composi­tions, and tonal changes of Hiroshige, this grand project resulted in 100 paintings, all of which she executed to resemble woodblock ink in texture and tone. 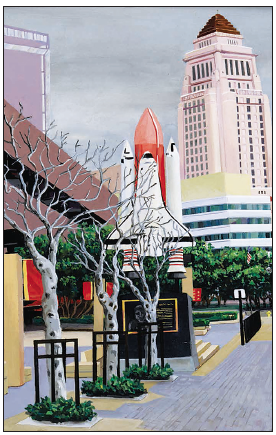 All of these original paintings have now been beautifully repro­duced and are accompanied by the artist’s personal commentary and historical insight about her subject matter—an alchemical mix that results in a unique and splendid tour of the vibrancy, quirkiness, charm, and essential personality of a great American city. Thomason is a native of Southern California. She received a master’s degree in printmaking from Cal State Long Beach and worked as a master printer in lithography at Gemini G.E.L. She has been on the Art faculty at UC Santa Cruz, University of Red­lands, Otis College of Art and De­sign, and elsewhere, and now lives in Los Angeles, where she teaches printmaking, sculpture, and painting at California Polytechnic University at Pomona. Her work has been widely exhib­ited and her paintings can be found in both public and private collections.